Energy is an indispensable aspect of our daily lives. We need it for heating, cooling, lighting and moving around; it is essential for the functioning of our homes, offices, work places and the entire economy. Its importance makes its accessibility a politically sensitive topic. This is one of the reasons why the Commission has proposed its Energy Union Strategy. The price of energy is also sensitive. On the one hand, low prices can be beneficial — they raise our purchasing power and standard of living and they reduce costs for our businesses and so increase their competitiveness. At the same time, since energy is delivered through markets, energy suppliers need prices to cover their costs and to finance investment to ensure the future delivery of energy. High prices send signals to reduce the use of highcarbon energy or to encourage energy efficiency and the use of innovative ecodesigned products and clean technologies. The history of energy prices and costs shows major changes and major impacts. In the 1970s and 1980s, restrictions by oil suppliers drove up prices and triggered economic shocks. More recently, new energy supplies and growing use of alternative energy sources have boosted supply, while energy efficiency measures and weak growth have reduced demand and brought wholesale prices down. The EU has found that the more competitive and liquid the energy market is, the more diverse and numerous our energy supplies and suppliers are, the less exposed we are to such volatility. This second report updates the analysis in a number of ways. First, through extensive ad hoc data collection undertaken with Member States’ statistical offices, the data on energy prices has been greatly improved, so that some of the conclusions we can draw are now even more detailed and clear. The data has been further updated, so it gives the latest picture available of the state of energy prices in electricity, gas and in the oil products sectors. In addition, the analysis of the aggregated and casestudy data is improved, enabling us to explore in greater depth the trends and impacts of energy prices, for households (especially those with low income) and industry (in particular, energyintensive industries). The review of energy costs also helps us understand how we can respond to energy prices, often by using energy more efficiently. The report draws on the evidence in the accompanying staff working document and of studies prepared on behalf of the Commission. Given the great proportion of imported energy, the impact of prices and of our consumption of energy is starkly displayed in the EU’s fossilfuel import bill. It shows the exposure of the EU economy to global energy price trends and also reminds us that to reduce our import bill our consumption of fossil fuels can be mitigated through increased energy efficiency and costeffective indigenous alternative energy. 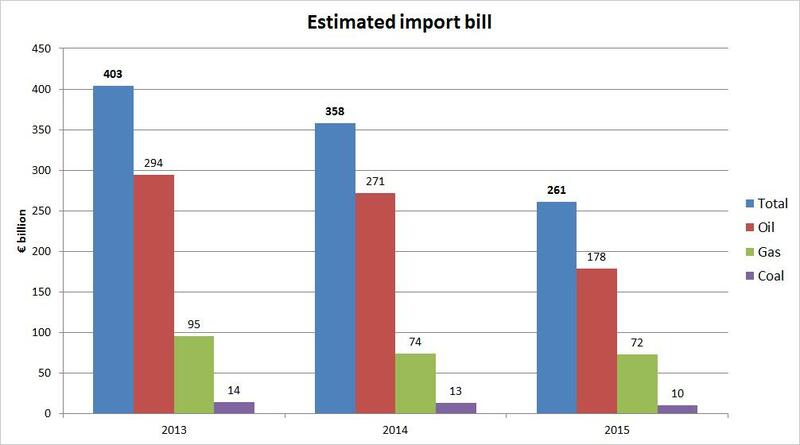 The energy import bill rose from €238 billion in 2005 to €403 billion in 2013. Falls in the prices of energy commodities and in consumption brought it down to €261 billion in 2015, some 35 % below the 2013 level. The price decline was the main driver of the reduction because, even though consumption of all three fossil fuels is falling, EU production of those fuels also declined, so net imports (and the EU’s fossilfuel import dependency) increased. Prices of all fossil fuels (most notably oil) have declined. This has been driven by increases in supply (US shale oil and gas, Canadian oil sands, robust OPEC production, increased global gas (including LNG) and coal production) and weaker demand (slower global growth, notably in China, but also structural changes on the demand side, such as growing energy efficiency and alternative fuels in the housing and transport sectors, driven by efficiency policies for buildings and cars). 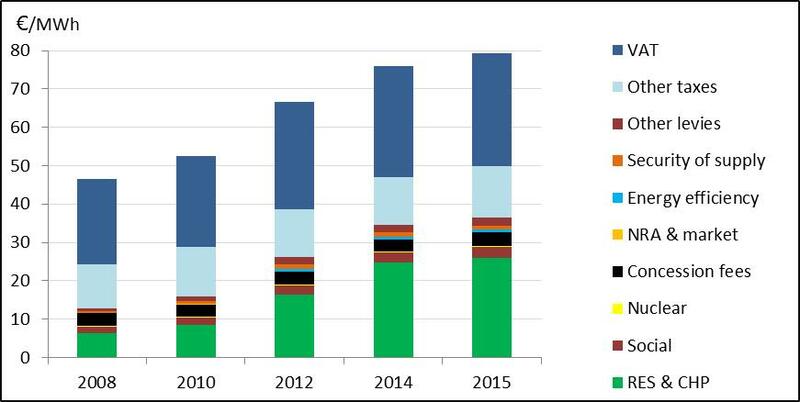 With the development of the internal market, wholesale electricity markets in Europe have undergone major changes in recent years. Wholesale electricity exchange markets have been established in almost all Member States, to provide day-ahead, forward and intraday trading. Flexible and liquid markets can allow a more efficient matching of supply and demand that lowers generation costs and therefore prices. Such exchanges should also steer bilateral ‘over-the-counter’ contract prices in the most mature markets. Gradually, these separate national wholesale markets are being coupled with neighbouring markets, which — together with more transmission grid inter-connections – create more liquid and efficient markets. Prices are driven by various factors, including fuel mix, crossborder interconnections, marketcoupling, market supplier concentration and weather conditions. Similarly, consumer and industry demand, demand management, energy efficiency and the weather influence the ‘demand side’ of the market. 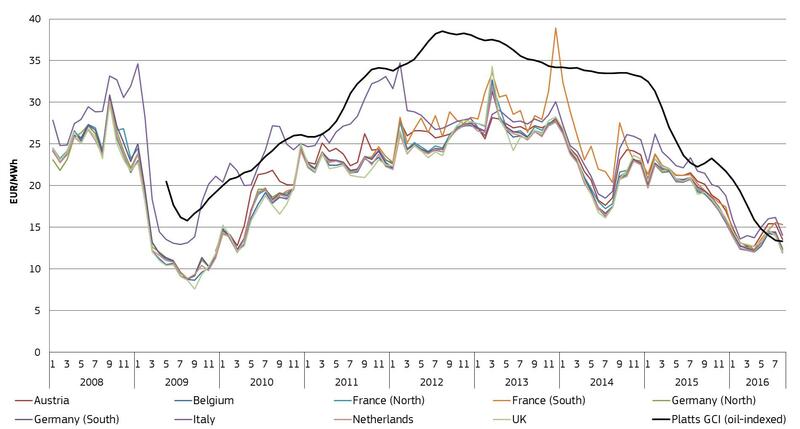 European wholesale electricity prices peaked in the third quarter of 2008 and, apart from a slight recovery in 2011, have been falling ever since. Prices have fallen by almost 70 % since 2008 and by 55 % since 2011 5 and in 2016 reached levels not experienced for 12 years. reduced demand for CO2 allowances and strong supply of international credits (CDM) has led to a large surplus in the ETS market, resulting in lower CO2 prices, which are passed through in wholesale prices. In perfectly competitive markets, changes in wholesale markets should pass through rapidly and fully to retail markets. However, in Europe, various factors restrict this passthrough 6 . In addition, a large proportion of retail prices is the result of regulation, in the form of taxes and levies or regulated network tariffs. The average 7 household price for electricity was € 208.7 MWh in 2015. In contrast with wholesale prices, the average price increased at an average annual rate of 3.2 % between 2008 and 2015. In order to understand better the drivers underlying this trend, it is necessary to investigate the different price components in detail. Figure 3 shows the development of the weighted average EU electricity price for households, broken down into its three main components (energy, network, and taxes and levies). The energy component (the part of the price paid to the electricity retailer) declined by 15% from 2008 to 2015. This change, small in comparison with the major changes in wholesale prices, suggests that competition in retail markets may not be completely effective. The analysis suggests that the passthrough of the energy component is influenced by the degree of competition in the market and the regulation of market prices. When regulated, retail prices were (logically) less responsive (in magnitude and speed) to the decline in wholesale prices. Moreover, the extent to which this energy component differed across Member States diminished by 19 % between 2008 and 2015, indicating that the development of the internal market has had an impact on wholesale price convergence and on that convergence passing through to retail prices. Overall, this suggests that, while there is some passthrough of wholesale market price changes, the energy component of price could be more responsive in the internal market. However, as can be seen from Figure 3, other components were subject to bigger changes. On average, the network component increased annually by 3.3%. The taxes and levies component also grew significantly, with its share of the average price increasing from 28 % to 38 %. The Commission’s analysis broke the taxes and levies component down into 10 sub- components, 8 which try to capture and treat consistently the various taxes and levies that Member States impose on household electricity prices. Levies are earmarked to support specific policies although they do not represent all government expenditure on the given policy. Taxes are normally not ear- marked to specific policies. VAT is the largest subcomponent, accounting for 37 % of the taxes and levies component in 2015, down from 48% in 2008. As an ad valorem tax, VAT has the advantage of not dampening wholesale price signals in retail prices. The largest reported subcomponent of relevance for energy policy is made up of levies supporting ‘renewable energy and combined heat and power’. It accounted for 33 % of the total component in 2015, up from 14% in 2008. 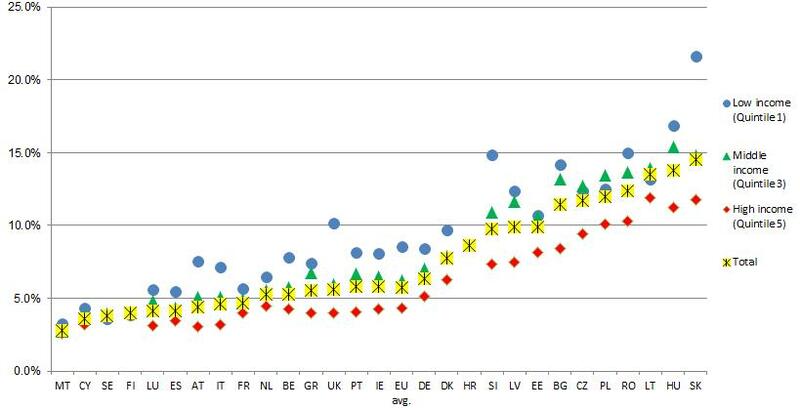 This analysis of EU average household prices conceals major differences across the EU. Prices diverge by a factor of three between the cheapest and most expensive country. Member States’ fiscal needs and policyrelated levies produce major variations in the share of taxes and levies in the final prices: for VAT and other taxes, this share ranges from 59 % (DK) to 5 % (MT); RES & CHP levies represent 12 % on average, 9 but range from 22-23 % (PT, DE) to 0-2 % (HU, IE). The figures for electricity prices for industry 10 show smaller increases, with the EU average increasing between 0.8 % and 3.1 % 11 a year from 2008 to 2015. Figure 6 uses a representative industrial consumption band (2 00020 000 MWh/year). Large energy consumers, including more electricityintensive industries, may produce their own power, have longterm contracts for energy supply or often pay lower network tariffs, taxes and levies which can result in prices 50 % lower than for other industrial consumers in the same country. As with household electricity prices, there remains major variation across Member States, with prices diverging by a factor of 2.75. The energy component of average industrial electricity prices fell by 2.8% a year between 2008 and 2015. The difference in this component across Member States also shrank, by 12 %. This partial price convergence implies that EU energy policies promoting increased competition, that results from market coupling and cross border trade, are having a positive impact. That said, seven Member States 12 actually saw a rising energy component over the period which, in some cases, could be an indication of inadequate price competition at retail level, allowing suppliers to avoid passing on lower wholesale prices. The network component of the industry price increased annually by 3.2% over the period and the share of the taxes and levies component increased significantly, from 12 % to 32 % of the price. On average, almost two thirds of the network price component are attributed to distribution networks, but data remains weak due to calculation methods differing across Member States. As with household prices, the taxes and levies component of industry data was broken down into subcomponents.7 As some sub- components (VAT and certain other taxes) are reimbursed to industry, this component remains significantly lower than for households: Industry pay €34/MWh and households pay €79/MWh. While it is clear that EU industry electricity prices vary significantly across Member States and sectors, it is also important to note the different average trends across the world. Source: Brazilian Ministry of Mining and Energy, Chinese Price Monitoring Centre, NDRC, Indonesian State Electricity Company, Russian Federal State Statistics Service; EIA data for Turkey, S Korea, Japan, USA and Mexico. The analysis shows that average EU industrial electricity prices are notably lower than in Japan, more or less similar to Brazil, China and Turkey, and higher than in Korea, the US, Russia and Indonesia. From 2008 to 2015, EU prices increased by 17 %, but price rises were significantly higher in China (66 %), Indonesia (41 %), Japan (34 %) and the USA (32 %). The analysis incorporates the effect of exchange rates, which is significant in some cases (e.g. the yuan’s appreciation explains the increase for China; prices rose only marginally in the national currency). Table 1 shows the development of the ratios of EU prices to those of its trading partners. e.g. EU prices were 2.2 times those of the USA and have fallen to 1.7 times. Gas constitutes 23 % of EU primary energy consumption. It fuels 15 % of our electricity and almost a third of both households’ and industry’s final energy needs. At the same time, the EU increasingly has to import gas 13 from a limited number of suppliers. For this reason, prices are even more exposed to global trends and properly functioning markets and infrastructure are even more important. EU gas wholesale prices were rising until 2013, but have fallen by over 50 % since. More than is the case with electricity, recent evident declines in wholesale gas prices in Europe are driven by global developments. Weak global demand resulting from the slow economic recovery and the restarting of certain Japanese nuclear power stations, (falling) oil price-indexed gas contracts and significant increases in the supply of LNG have generated downward pressure and led to a convergence of wholesale gas prices. EU household gas prices have increased since 2008 by almost 2 % a year. Prices have converged significantly in that period, but the highest prices (SE) are still almost four times the lowest (RO). The energy component increased by 0.3% a year between 2008 and 2015 although experienced fluctuations during that period. The network component increased annually by 2.5 %, contributing significantly to the overall price increase for households.The taxes and levies component saw an increase of 4.2% a year, to € 15.6 MWh. The increase of this last component is largely driven by general taxes. (Sub components are not significant and are discussed in the staff working document). Gas prices for large industrial 14 consumers in 2015 were below those of 2008. The energy component remained by far the largest component and thus the most prominent price driver. The impact of taxes and levies is low, accounting for only 8 % of the price. Industrial gas prices are determined by international commodity prices rather than highly divergent national taxes and levies, so prices for large industrial consumers show relatively small variation across Europe. The composition of prices for large industrial consumers remained remarkably stable over time. Industry gas price shows the greatest passthrough of wholesale to retail price and has converged across national markets by 58 % since 2008, indicating that EU gas markets are more integrated and competitive than in the past. International gas prices showed a marked convergence in 2014 and early 2015. The ratio of EU gas prices to US gas prices has evolved favourably over the last two years. EU gas prices were on average two and a half times the US gas prices in 2015 while this ratio in 2012 was between 3 and 5. This was driven by factors such growing global supplies of gas and European access to LNG, weaker European and Asian demand and oil-indexed gas prices. Asian LNG prices decreased significantly in 2014 to converge with European prices by early 2015. Source: EIA, Platts, Brazilian Ministry of Mining and Energy, Chinese Price Monitoring Centre, Russian Federal State Statistics Service. For the USA and Japan, wholesale and LNG import price data are compared with west European LNG import prices. e.g. EU prices were 3.3 times those of the US and have fallen to 2.5 times those of the US. Crude oil prices have been declining since mid-2014, driven by weak demand and robust supply growth. From a USD 115/bbl peak in June 2014, Brent dropped to USD 26/bbl on 20 January 2016, its lowest level since 2003. This means the price decreased by 77 % in 19 months. By June 2016, prices had recovered to USD 50/bbl and have since been in the USD 4050/bbl range. The sharp fall in oil prices has passed through to retail markets, but its effects are mitigated by the the depreciation of the euro and the excise duties on oil products, which represent a large proportion of the consumer price. Still, gasoline and diesel consumer prices (including taxes and duties) decreased by 24 % and 28 %, respectively, between the end of June 2014 and mid-February 2016, when retail prices bottomed out and average European consumer prices for motor fuels were at their lowest level since 2009. Taxes and levies on gasoline and automotive diesel are high, but have varied little over time. The EU Energy Taxation Directive 15 sets minimum excise duty rates, but nearly all Member States choose to set higher rates. Excise duties on gasoline range from €0.36/litre in Bulgaria (the minimum rate) to €0.77/litre in the Netherlands. For a combination of environmental, economic and fiscal reasons, gasoline and diesel are a significant tax base for Member States. In 2015, taxes accounted for 63 % of the average retail gasoline price and 57 % of the diesel price. From the above discussion, it is clear that wholesale prices for electricity, gas and petrol have been declining due to a number of factors (e.g. increasing supply and reducing demand). This has resulted in falling retail prices for petroleum products. However, retail electricity and gas prices remained constant or increased slightly as rising network costs, taxes and levies have absorbed such falls in wholesale prices. Such price trends, in conjunction with our consumption of energy, are important for assessing the impact on household and industry energy costs. For households, the final energy consumption of electricity, gas and heating oil has fallen or risen only slightly since 2008. The rise in retail electricity and gas prices, however, meant that EU household energy expenditure (excluding transport (petrol), which is reported separately) rose from 5.3 % of household expenditure in 2008 to 5.8 % in 2014. At the same time falling retail petroleum products prices contributed to the drop on transport fuel expenditure, which fell from 4.3% of household expenditure to 3.9%. Source: European Commission, national statistical institutes and own calculation. The average value of household energy expenditure (separate from transport) hides wide variations between Member States (wealthier and less wealthy, warmer and colder) and across income groups within Member States. The share ranges from 3 % in Malta to 14.5 % in Slovakia. Analysis of different household types demonstrates that poorer households spend a higher share of their income on energy than wealthier households. On average, the share of household expenditure accounted for by energy is 8.6 % for the poorest households (as against 5.7 % in 2004), 6.2 % for middleincome and 4.3 % for highincome households. This demonstrates that, especially in times of low economic growth, vulnerable consumers are relatively more affected by price increases than the average household, highlighting that social measures targeting vulnerable consumers are needed to address energy poverty. 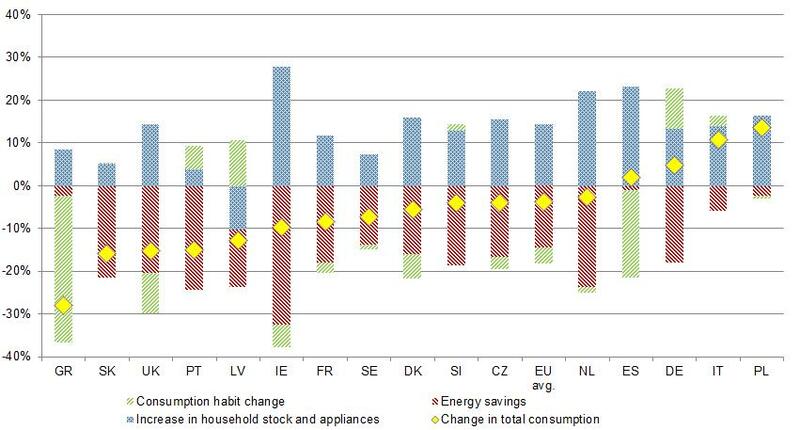 The analysis also shows that households in some Member States have reacted to increasing energy prices and costs by reducing their energy consumption (see Figure 18). EU household energy consumption (excluding transport) declined over the period by approximately 4 %, despite the increase in the number and size of households. This has been driven largely by energy savings. In many cases, it has been the result of improved residential energy efficiency, but in some countries purchasing power constraints might have driven the dramatic decreases in consumption. The energy price developments in recent years have not increased the energy cost share of production costs for European businesses, which lies at less than 2 %. However, to reduce the cost of energy to industry, most Member State governments provide subsidies through exemptions and reductions in energy taxes and levies (e.g. renewable energy or energy efficiency levies, or network tariffs). Depending on the characteristics of a business and the Member State in which it is based, it may enjoy energy prices 50 % lower than another company in the same sector. That said, for some industries in which energy costs are more significant and exposure to international competition is high, there is a need to assess energy costs more closely. These are energyintensive industries of a certain economic significance and trade exposure (where energy costs account for at least 3 % of total production costs and for up to 40 % on average or more in some cases). The analysis undertaken for the Commission shows that, for the 14 sectors selected, energy cost shares and absolute energy costs fell in most cases between 2008 and 2013. This is the result of the fall in energy prices, tax exemptions and reductions, lower energy consumption related to reduced production levels, a shift in production to less energyintensive products, the uptake of energy efficiency measures and slower reductions in other production cost factors. The European economy overall is not a highly energyintensive economy. For decades, the EU has been restructuring its economy in the face of changing domestic and global markets and demand for different goods and, increasingly, services. Restructuring also results from changing resource availability, price signals and technology developments. However, as noted above, certain energyintensive industries face international competition. For this reason, it is important to assess how energy prices and costs developments in the EU compare with international developments. As noted in earlier sections, average EU electricity and gas prices for industry rose comparatively moderately from 2008 to 2015 and those in Asian countries (China, S Korea and Japan in particular) rose significantly faster. 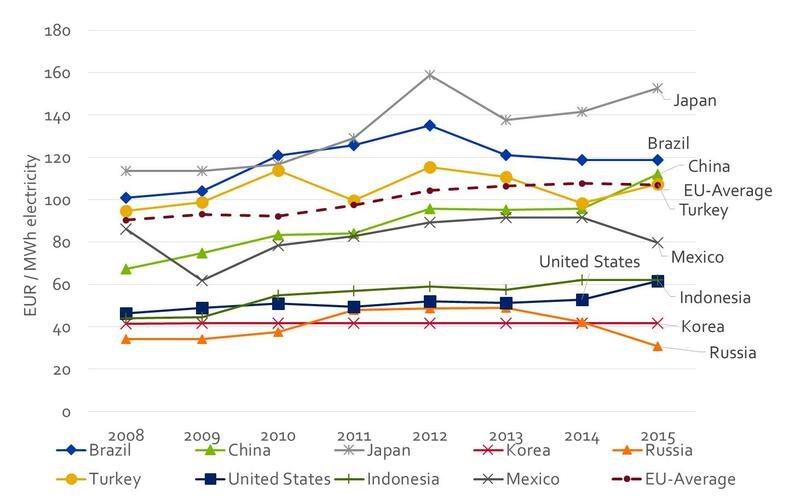 The (limited) data available for comparing the industry's energy costs and energy intensities 16 around the world suggests that Chinese energyintensive industries are far more energyintensive than US and EU industries 17 . In contrast, some EU industry sectors appear to be more energy intensive than its US counterparts Despite this, in most cases, energy appears to account for lower proportions of the production costs of energyintensive industries in the EU than of those in the USA and higher proportions than those in Japan. However, energy cost shares have fallen faster in the USA than in the EU since 2008, which signals, beyond the lower enery prices in the US, that US energyintensive industry could also be ‘catching up’. As from 2008, evidence on energy efficiency improvements 18 in some European energy intensive industries signals that these seem to have slowed down or even stopped. This could be explained by factors such as possibly limited scope for technical improvement, reduced capacity utilisation rates but also insufficient availability of capital to invest. A competitive and properly functioning energy market is expected to deliver the energy that households and industry need in the most costeffective manner. The clearer the price signals and the closer the alignment between prices and production costs, the more efficient energy production and consumption will be. However, in various respects, the energy market is not functioning properly. A range of market and regulatory failures have led governments to intervene in a wide variety of ways over the years to steer the development of the energy sector. Regulatory or financial measures affecting energy producers or consumers have been introduced to achieve policy goals such as reducing pollution and greenhouse gas emissions, improving security of energy supply or reducing the cost burden of energy on poor households or vulnerable businesses. Such measures often subsidise energy production and consumption and may correct price signals to reflect market failures. They include explicit measures reflected in prices, as illustrated in the energy taxes and levies subcomponents discussed above. However, some (e.g. some energy demand measures or below-cost regulated prices) may also blunt price signals that would otherwise steer energy consumption and production, energy efficiency and investment. Fossilfuels subsidies are particularly problematic, as they disadvantage clean energy and hamper the transition to a lowcarbon economy. In 2014, the Commission produced an extensive study on the nature of energy costs and subsidies in Europe 19 . This found that a wide range of government interventions constituted significant subsides to the energy sector (excluding transport), amounting in 2012 to €113 billion, of which approximately €17.2 billion was for direct fossil fuel subsidies to electricity and heating 20 ; fossil fuels for transport were separately estimated at €24.7 billion. If broader international (IMF) definitions are applied, including external costs, fossilfuel subsidies rise to €300 billion 21 both in the EU and Russia, €250 billion in India, over €2 050 billion in China and €630 billion in the USA. The EU is committed to removing fossil-fuel and environmentally harmful subsidies, so that the energy market becomes more competitive and price signals improve to help steer a more efficient allocation of resources in line with the EU’s commitments to tackle climate change. The recent relative fall in energy prices should make it easier for governments to remove tax exemptions and other price and energy demand subsidies. In addition, it would also contribute to fiscal consolidation. A further common form of intervention in energy markets is energy taxation. As indicated above, this can be used to correct market failures, but governments also often seek wide, stable tax bases for delivering stable public revenues to finance government expenditure. The consumption of energy has long provided such a base. In 2014, energy taxes 22 collected by EU Member States totalled €263 billion, equivalent to 1.88 % of EU GDP. Excise duties make up the largest part of energy taxes. In 2015, excise duty revenues alone amounted to €227 billion. 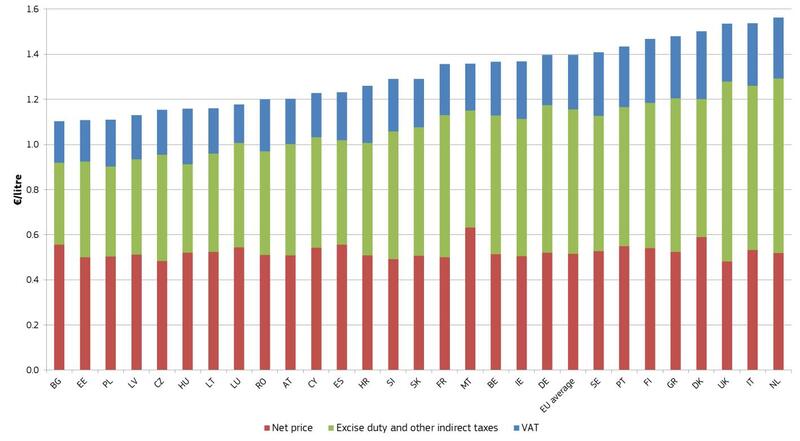 Reduced consumption of energy products would have resulted in a fall in excise duty revenues, but Member States often increased the rate of excise duty. Thus energy consumption continues to provide an important tax base for public revenues, helping Member States to consolidate difficult fiscal positions. More generally, energy taxation can have a positive impact on growth compared to taxation on labour and investment. Energy prices have a further impact on broader, macroeconomic aspects of the EU economy, through inflation. Energy plays a clear role in household expenditure and industry costs, as well as a role through petroleum prices, in the transport sector in particular. As such, energy prices are a significant factor affecting inflation. Energy price peaks in 2008 and even 2011 contributed 1 % to EU inflation at the time, just as lower prices are now having a deflationary impact on the EU economy. The rapid decline in energy commodity prices in the last years, notably for oil but also for gas, stems from technological change as well as market and geopolitical developments. It has changed the energy landscape dramatically. In Europe, a major energy importer, it has brought welcome temporary relief for households and businesses in difficult economic conditions and given a ‘one-off’ boost to the economy. It shows the importance of developing global markets for energy, especially for an energyimporting region such as the EU, and it reduces price differences vis-à-vis other regions. This is especially relevant for gas, where the global development of LNG markets and new sources of supply are creating opportunities for Europe: it can help narrow the gas price differential with other parts of the world such as the USA and, from a decarbonisation perspective, it improves the competitive situation of gas versus coal. However, lower prices may distract attention from the energy challenges we are facing of energy security, competitiveness and climate change. These have not disappeared. Indeed, the data and analysis in this report show a much more nuanced picture and can help us to identify the right approaches and policies as we develop the Energy Union within this changing energy landscape. Low prices should be not taken for granted. The data in this report shows how supply and demand can shift abruptly. This is even more the case as new resources such as shale gas and oil wells are rapidly exhausted and need constant replacement investment to maintain production. While most business activity incorporates energy costs as a small share of total production costs, Europe’s energyintensive industries continue to be sensitive to price rises. As measured through energy intensity, available evidence suggests that the USA's energyintensive industry could be catching up in energy efficiency terms with the EU in some sectors. More investment in energy efficiency may help to redress this, together with a shift to innovative, higher added value products. With large differences across Member States, significant tax reductions and exemptions are available to certain energyintensive industries. Such subsidies should be granted only where needed to support the European industry in the event of unequal international competition while minimising price distortions. More broadly, Member States should take advantage of the current lower energy prices to remove inappropriate subsidies and tax exemptions which distort price signals and delay the transition to a lowcarbon economy. A multitude of factors shape energy prices and costs trends in Europe. One clear finding of this report is the divergence between wholesale and retail electricity price developments. While wholesale prices have reached in 2016 their lowest levels for 12 years, household prices have increased by an average 2-3 % per year 23 . It results from improved market functioning mixed with market failures, and increased taxes and levies. The fall in wholesale prices is linked to energy commodity prices, reduced demand and improved market functioning, through marketcoupling. Depending on the regional market, there is also overcapacity in power generation and new capacity is not warranted until older capacity withdraws from the market. National measures such as capacity mechanisms and renewable energy support also drive down wholesale prices, further reducing revenues and countering the built-in rebalancing price signals of the market. Given the major investment in generation capacity that will be needed in the longer term to achieve its security of supply, competitiveness and decarbonisation objectives, the EU needs a market design and energy policy framework that relies on market mechanisms, enabling investment in low carbon and flexible generation with demandside management, storage and crossborder connectivity. The decreases in wholesale prices seem to feed through only slowly and partially to retail consumers, albeit faster for industrial customers. This suggests that competition in retail markets can improve further. In addition, rises in network tariffs, taxes and levies have mostly outweighed the decline of wholesale prices. Such rises may be the result of much needed investments in cross-border interconnections and smart grids, which deliver benefits in terms of efficiency, the internal market and energy security. Tax and levy increases may be introduced to correct market failures, for general fiscal reasons or directly to finance energy generation investment. (It is essential that the energy system costs are fully covered within the sector by the consumers, and that tariff deficits are not allowed to be accumulated.) However, they should not reeuce the incentive for energy producers to invest The low pass-through of wholesale to retail prices and household and industry responsiveness to prices imply that the EU should continue to drive forward the development of the internal energy market, with a functional electricity market design in particular. Competitive markets must develop across the EU, where both consumers and producers are able to flexibly respond to either wholesale or retail price signals. Wholesale energy prices that fully cover investment and operating costs are necessary if investment in the energy sector is to be driven by market forces. On all these aspects, the Commission’s forthcoming proposals on market design, retail markets, renewable energy and governance are crucial to establish an innovative and competitive energy sector which can deliver affordable energy to Europe’s households and industry, enabling European industry to compete effectively in the global economy. This led to the Commission’s proposal and the adoption of Regulation of the European Parliament and of the Council on European statistics on natural gas and electricity prices, Regulation (EU) 2016/1952, 26 October 2016. See references in the Action Point 8 the Energy Union Framework Strategy (February 2015) and the updated roadmap for the Energy Union (November 2015). European Commission 2015 winter forecast simulations. 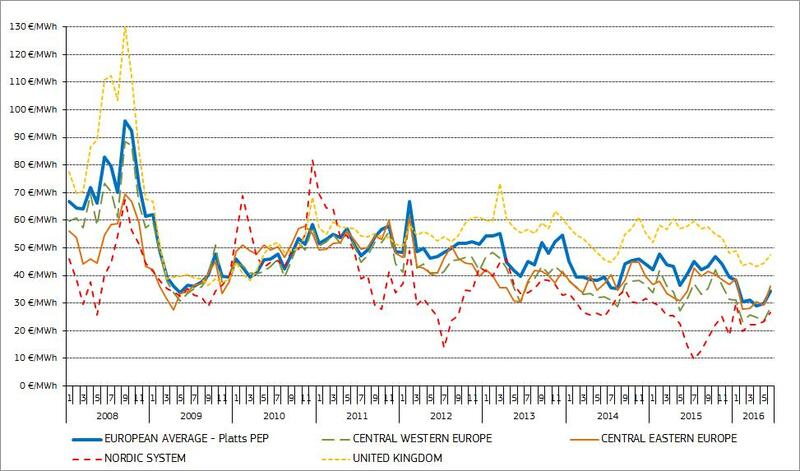 Platts weighted European average electricity price. Average prices refer to weighted EU28 average prices. 10. Other taxes (excise duties (listed by some MS as electricity tax, natural gas tax, energy tax, final energy consumption tax, special energy tax, environmental tax) and taxes such as distribution, transmission and greenhouse gas emission taxes). In 2015, 28 % of EU electricity was produced from renewable sources. In the case of industrial consumers, final retail prices exclude VAT, as it is reimbursable. In industry, prices for large energy consumers (70 000-150 000 MWh/year; i.e. Eurostat IF consumption band) increased by 0.8 %/y; for medium consumers (2 00020 000 MWh/year; i.e. ID band) by 2.3%/y; and for small consumers (20-500 MWh/year; i.e. IB band) by 3.1 %. Aggregated data do not reflect all changes to prices for individual companies. HR, FR, IE, LV, PL, PT and UK. In 2015, import dependency for gas was 69 %. Council Directive 2003/96/EC of 27 October 2003 restructuring the Community framework for the taxation of energy products and electricity (OJ L 283, 31.10.2003, p. 51). Energy intensity is defined as the energy used per Gross Value Added. Energy intensity can be used as an indicator of technical energy efficiency but it will be influenced by the economic factors affecting the evolution of Gross Value Added. The available data is not representative for basic chemicals, steel or aluminium. Energy-related environmental taxes as defined by Regulation (EU) No 691/2011 on European environmental economic accounts; these do not include VAT on energy products. Industry electricity prices increased by around 2 %; industry gas prices were stable or declined.